U.S. Senator Cory Booker from New Jersey isn’t ready to talk about his rumored campaign for presidency in 2020, but he did sit down with Google’s senior counsel on civil and human rights Malika Saada Saar at South by Southwest on Friday to talk about the power of human connection and social justice. Oh, and tech’s influence on modern-day politics during, what he called, one of the most fear-based eras he’s ever seen. “These [last few months] are some of the darkest moments of my political career, but also some of the most inspiring, thanks in part to social media and other communication tools,” Booker said. Despite this fear-based climate, we now have access to information quicker than ever thanks to our always-on connected culture, but the key is engagement and what we do with this awareness. 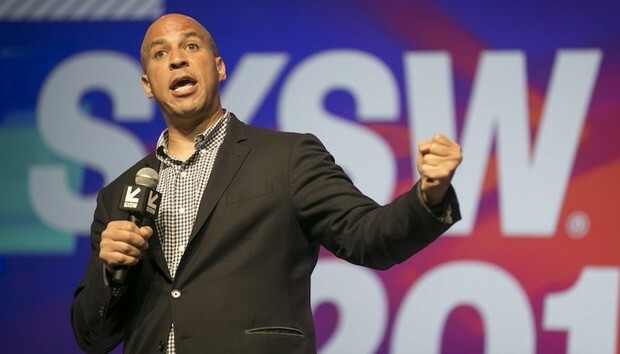 Here are three key takeaways of Senator Booker’s SXSW kickoff keynote. The combination of smartphone video and social media spreads rapid-fire awareness to issues that Booker has been working on for years. He mentioned the protests in Ferguson, Missouri, as an example: Police and criminal injustice has long been a problem, but smartphone videos and social media have brought it into the spotlight. “A lot of folk are just now getting woke to what’s going on,” he said. And that’s OK—Booker is glad to bring more people into the fold. But he worries that that awareness will just stop there. Some of the biggest social movements of the age started out as small online communities, and they never would have been able to reach the growth without the social media boost. Black Lives Matter started as an online love letter to the black community, and the Women’s March on Washington started as a Facebook post, Saar pointed out. But while these communities have activated for social good, some don’t grow in quite the same way. The conversation shifted to one of the hot-button issues of the 2016 election: the social media echo chamber. Booker worries that we’re just hearing each other and agreeing—“Nothing is going to change, unless we do,” he said—which is why he feels we have an obligation to seek other views, citing his own media consumption habits as an example. Besides social media advances, Booker wants to see the rest of the tech sector reach its fullest potential, and to do that, he thinks the U.S. government needs to ease up on regulations. “We’re not moving at the speed of innovation due to regulations,” he said, adding that because of this, key industries are leaving the U.S. to work on projects in other countries where the rules aren’t as strict. For example, the Federal Avian Administration has hindered drone innovation to the point where drone companies are leaving the U.S. to test and build in Europe.